I love beauty serums, whether they are made for the face or the hair. Serums are like moisturizers, but contain a higher concentration of active ingredients to give your skin and hair a healthy, velvety smooth finish. Since the last couple of weeks was a cycle of cooler rainy weather and searing hot days, my skin has been feeling a bit dry and cracked. This is normal for me, as my skin tends to react to changing weather patterns this way. Because of the weather, my usual moisturizer wasn’t doing it for me, and I have been seeing little white patches of peeling skin, mostly on my cheeks and nose. 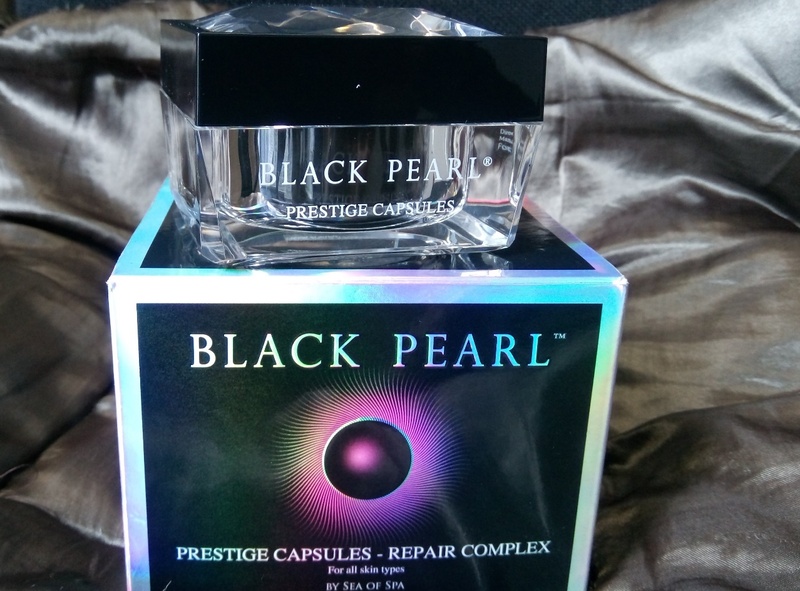 Luckily, I got to try Sea of Spa’s Black Pearl Cosmetics Philippines’ Prestige Capsules Repair Complex, which is another interesting face serum from Black Pearl, a natural, cruelty-free beauty line licensed by the Israeli Ministry of Health. This face serum is designed to repair your skin from damage caused by age and sun exposure. It claims to give you a more luminous, glowing complexion. This is a welcome addition to my beauty routine, especially since my skin has been feeling dry and damaged because of the recent weather. Unlike other face serums, which often resemble a lotion, this face serum kind of reminds me of the hair serums or Vitamin E capsules you can buy in drug stores. 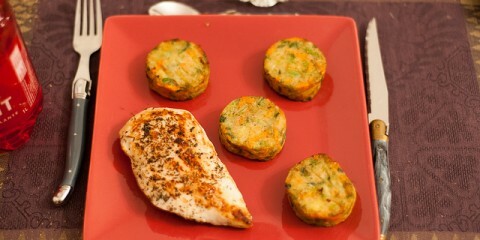 It is thick and clear, with a texture that is both waxy and oily at the same time. 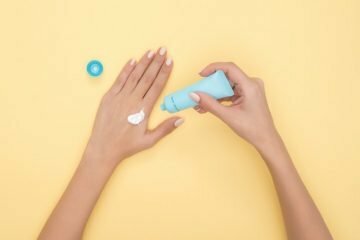 Taking a look at the ingredients list, the primary ingredients include several types of silicones. Silicones are often used in cosmetics as lightweight emollients, for they smoothen and condition the skin. Makeup primers often contain cosmetic silicones because they leave the skin silky and even toned. Other ingredients include Echium Plantagineum oil, which is a type of flower found in Europe in Asia. 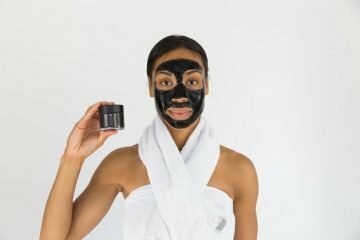 This oil supposedly improves the elasticity of your skin. It also contains several essential oils from other herbs, including Borago Officinalis, Zea Mays, ginseng, and Centella Asiatica. These ingredients repair and moisturize the skin, and are especially useful for repairing sun damage. 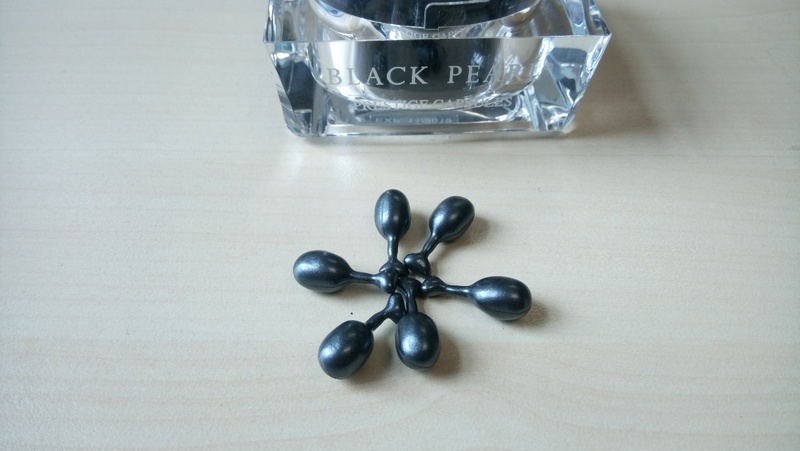 The first thing I noticed about the Black Pearl Cosmetics Prestige Capsules is that it has absolutely gorgeous packaging. The outer box features holographic trimmings, while the inside contained a jar with a fancy jeweled cap. Though made of plastic, it feels heavy and solid in my hands, which makes it all the more luxurious and expensive looking. When you open it up, you are greeted with the cutest little capsules. 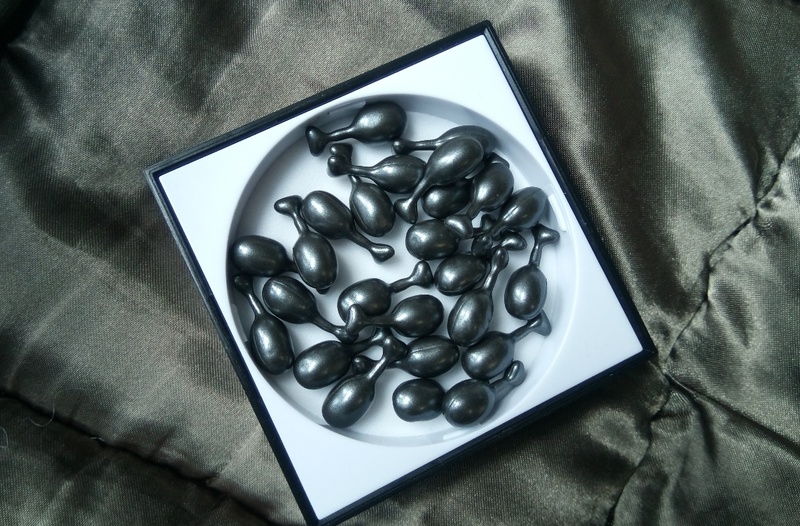 They are black, with a shiny, pearlescent finish. Like its namesake, they really do like little black pearls (or fancy grapes)! Each capsule is soft and gelatinous. You have to pinch off the top and squeeze it out onto your hand so that you can rub it onto your face. 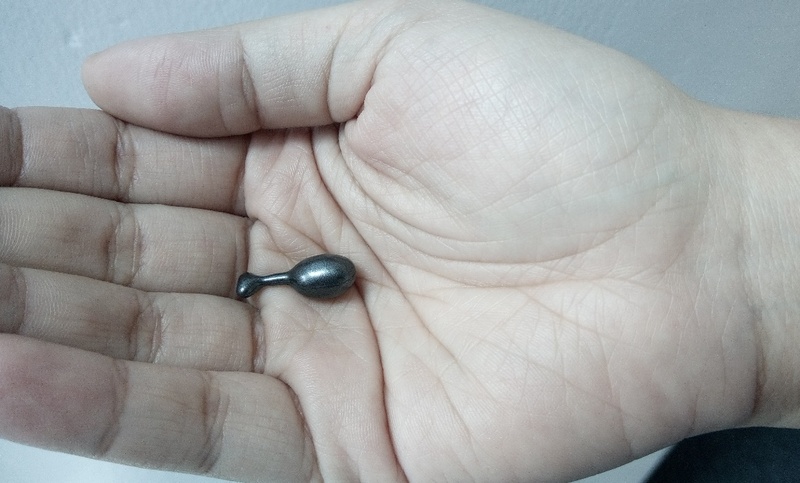 Though I found the capsules small at first, I quickly discovered that it dispenses just the right amount of product to cover your face, neck and collar bone area. The great thing about this kind of packaging is that it is virtually foolproof — not only does it dispense just the right amount of product, but it also keeps the remaining product clean and free from bacteria. Very hygienic! Unfortunately, I am not a fan of the smell — it is musky and heavy, though it does dissipate after a while. If you let it sit a bit, the smell should go away on its own. The actual product itself feels thick and oily, but not unpleasant. When you apply it onto your skin, it leaves a heavy, shiny layer of product on your face. Since it is so thick and somewhat sticky, I decided to apply it at night and then go to bed with it, which should allow it some time to be absorbed into my skin. The next morning, I woke up and washed my face. By this time, the serum has completely been absorbed into my skin, leaving behind only a little bit of residue. I am impressed that it left me with baby smooth skin, and that it actually managed to hydrate it. My skin felt wonderfully soft and supple, free from the peeling patches I’ve been recently getting. 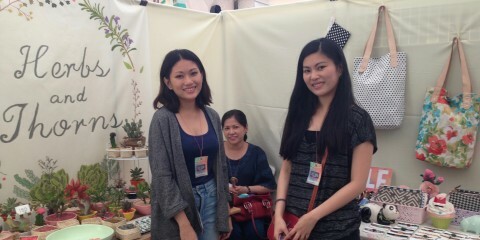 Though it did feel heavy at first, I find that its thick texture was just what my damaged skin needed. Though it won’t replace my everyday moisturizer, it is definitely a great choice for when my skin needs that extra boost. 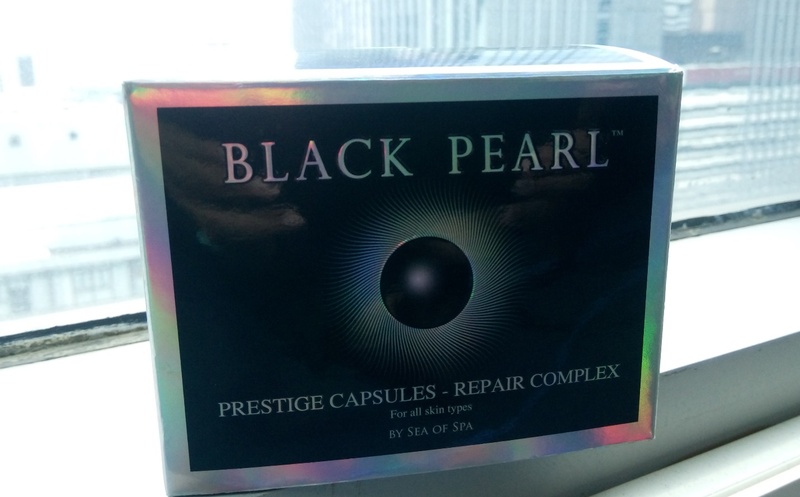 Upgrade your skin rejuvenating routine with Black Pearl Cosmetics' Philippines Prestige Capsule Repair Complex!